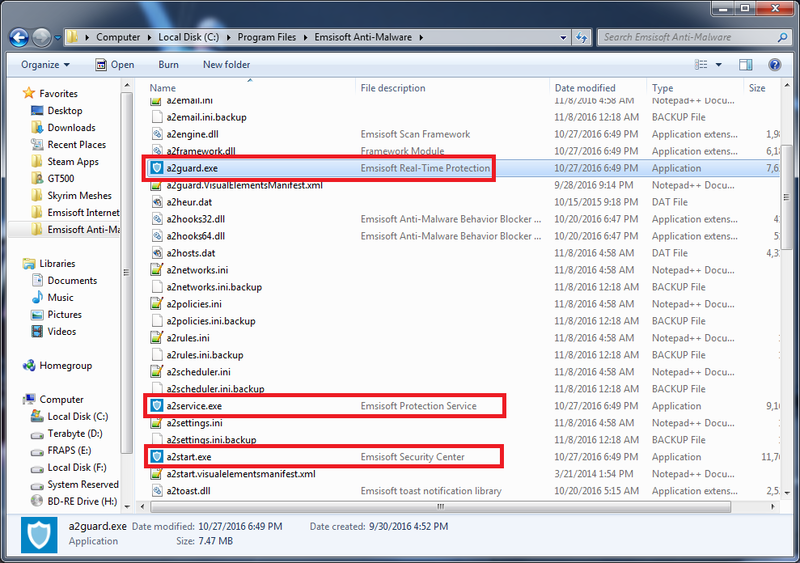 Small issue: all EIS a2xxx.exe processes are described as Emsisoft Anti-Malware components. Can lead to mild confusion with applications that list installed programs/running processes based on their description. The file descriptions are different for all of the files. Since logs get posted in this section of the forums, our management has decided to restrict access to attachments so that only employees can see them. If you want images to be visible in your posts to yourself and other users, then you can use an image sharing service (Imgur, Postimage, etc) to upload the file to, and then you can copy the URL to the image file and embed it in the forum post. Some image hosting services will have pre-formatted BBcode that you can just copy and paste into your post as well. Did the OP's image show what he said - ie incorrect descriptions? The forum runs on your own servers; is there no way that you can preprocess attached files and sideline those that contain plain text, but allow images? I guess that wouldn't be secure if someone uploaded an image of a log, but that's true of such an image on an image-sharing website too. Can you alter the editing windows so that people are reminded of this problem when writing replies? It's not useful for no-one except staff to be able to see screenshots, as it prevents others from identifying that they have the same/similar problems. The same applies to the other processes. My EIS folder has 19 files with a "Product Name" of EAM. Three of them mention EAM in their descriptions. In both screenshots you highlighted the Product Name. All of the files are from the same product, so they should all have the same product name. The "File description" on each file is different, and this is what is displayed in the Task Manager on Windows 8, 8.1, and 10. Unfortunately IPB forums don't (currently) have that feature. I imagine there's a plugin/mod somewhere that could add such a capability, however adding plugins can block upgrades, which leads to security holes. With our CTO upsetting almost every ransomware developer out there with his decryption tools, we can't afford to take the risk and do anything that could prevent us from installing forum updates as soon as they are available, so plugins/mods are currently not an option (regardless of how convenient they might be). I'll inquire about an informational sticky topic that explains this. I'm not sure what adding it to the full editor for posts would entail in IPB, so it might not be something easy to do. GT500, I never argued about all of them being the same, not sure why you insist on that. My only point was: that (same) Product Name should be EIS, not EAM. It is just wrong, that's all. I'm sorry, I must have misunderstood. Emsisoft Anti-Malware and Emsisoft Internet Security are from the same code base, and are simply configured differently when the installers are built (EIS gets a couple of extra drivers and the extra firewall features are enabled). I'll ask about whether or not we can change the name in the file information, however I expect that the same binaries are used for both and thus the file information will be exactly the same for both. Our QA Manager has confirmed that both installers for EAM and EIS use the same binaries, therefore the product names on all of the files are the same. Then it would only be a matter of maintaining two separate installers with just a few renamed descriptions differentiating them. Unless this involves too much extra work, I don't see why it can't be done. Anyway, I'm not insisting (hardly a big issue) but since these are clearly separate products -even if using same code base- they should be described as such, even in the esoteric processes properties. If they have to have one name, it could be changed to be less specific, eg "EAM/EIS". It would require extra scripting, extra disk space, and making sure that two sets of files get updated instead of just one. It's not beyond reason, but it does add extra places where mistakes can be made. It's certainly doesn't sound unreasonable (at least not to me), but I can't say for certain if any changes will be made in this area. That being said, I will pass the suggestions you've both made on, and let our management consider them.